Home › Featured › Public Hearing about the Monster in the Mission! Public Hearing about the Monster in the Mission! The time has finally come for the very first public hearing about the Monster in the Mission! Join The Plaza 16 Coalition, tenants, friends and neighbors on February 7th at Mission High School. 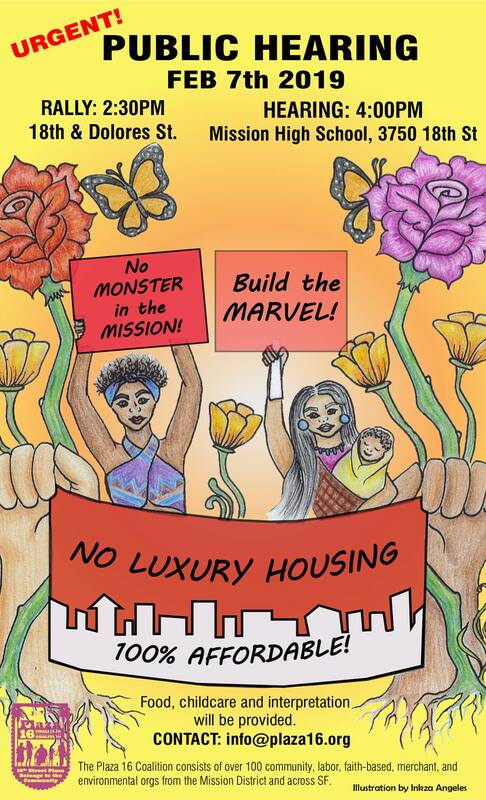 We will have the opportunity to speak directly to the Planning Commission and demand that they make the right choice and take a stand against the Monster in the Mission and support the 100% community developed affordable housing! Planning should always be a public and accessible process where the people most impacted by a project should be able to authentically inform the decision. This hearing is a real example of how planning decisions should be made. As always, childcare, food, and interpretation will be available. Let’s show Maximus and the City what people power Mission-style looks like! ¡Por fin ha llegado el momento de la primera audiencia pública sobre el Monstruo en la Misión! ¡Acompañenos el 7 de febrero en la Mission High School y tenga la oportunidad de hablar directamente con la Comisión de Planificación y exigirles que tomen la decisión correcta y tomen una posición en contra del Monstruo en la Misión y apoyen el 100% de viviendas asequibles desarrolladas por la comunidad! Planificación siempre debe ser un proceso público y accesible donde las personas más afectadas por un proyecto deben poder informar la decisión de manera auténtica. Esta audiencia es un ejemplo real de cómo se deben tomar las decisiones de planificación. Como siempre, habrá cuidado de niñxs, comida e interpretación. ¡Vamos a mostrarle a Maximus y la ciudad cómo se ve el poder del pueblo al estilo Misión! ‹ In the Dual Fight for Prop 10 & C, We’ll Celebrate One Victory & Keep On Fighting!